Dr Hideo Sakamoto, an experienced tutor/lecturer, founder of Sakamoto Seminar Co., Inc. Japan, has taught Mathematics to students in his school, Sakamoto Seminar, Osaka, for a quarter of century using the Sakamoto Method he invented in Japan. Originated from Japan in 1975, the method is now being used in various countries including Japan and Singapore where primary Mathematics standard is among the world highest. We provide an innovative programme using our highly acclaimed Sakamoto Maths Method that helps franchise centres to differentiate themselves from other tuition centres who are using conventional method and teaching materials. An innovative method for problem solving, it provides students with a simple yet systematic and structured technique to analyse questions in a logical way and solve the questions without any difficulty. Our worksheets are specially developed with emphasis on problem solving, understanding of concepts and applications and not on rote learning. 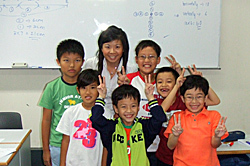 Since our enrichment programme was approved by Ministry of Education, Singapore, in 1997, Sakamoto Maths classes have been conducted in some Asian countries like, Singapore, Thailand, Indonesia, Korea, Philippines and Vietnam. 1972 Established “Osaka University Volunteer Meeting” which was a tutor’s group aiming to provide guidance for examinees. 1975 Established “Special Training Private School” which specialized in preparing students for entrance examination of junior high school and started managing the private school in addition to “Osaka University Volunteer Meeting”. 1980 Changed their name to “Sakamoto Seminar”. 1983 Incorporated the firm as “Sakamoto Seminar LLP”. 1994 Established “Sakamoto Educational Systems Pte Ltd” in Singapore. 1996 Incorporated the firm as “Sakamoto Seminar Co., Inc.” in Japan. 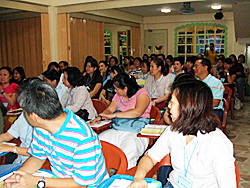 1997 Programme was approved by Ministry of Education, Singapore. Sakamoto Maths classes are being conducted by qualified Sakamoto Maths teachers at franchisee centres. 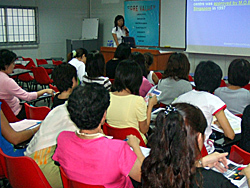 Class size is small so that the teacher can give a maximum attention. The teaching materials are original which were developed in Japan. Newly enrolled Primary 4, 5 and 6 students are required to attend Sakamoto Introductory Workshop before they join the regular Sakamoto Maths classes. This introductory workshop is compulsory for all new students in Primary 4, 5 and 6. In the workshop, students will study the basic rules of the method and will be able to have idea what Sakamoto Maths Method is. Please make an enquiry to franchisee centres. To meet such requirement, we will be conducting a chargeable workshop for Parents. Please e-mail to us. We will inform you the next Chargeable Parents’ Workshop schedule once confirmed. To meet such requirement, we are holding 2-hour free workshop for school teachers. We will hold Free Parents’ Preview at some franchisee centres during school holidays. Kindly make an enquiry to our franchisee centres. We are organizing Maths competition once a year. The winners in the national level competition held in each county are entitled to participate in the final round, World Mathematics Competition (WMC). 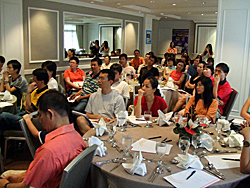 We hold WMC every in some Asian countries. Please fill in your name, your friend's name and email address. They will receive an email regarding this site.